Location: Murat, in the Cantal departement of France (Auvergne Region). Ownership / Access: Anterroches Family and it is a private home. 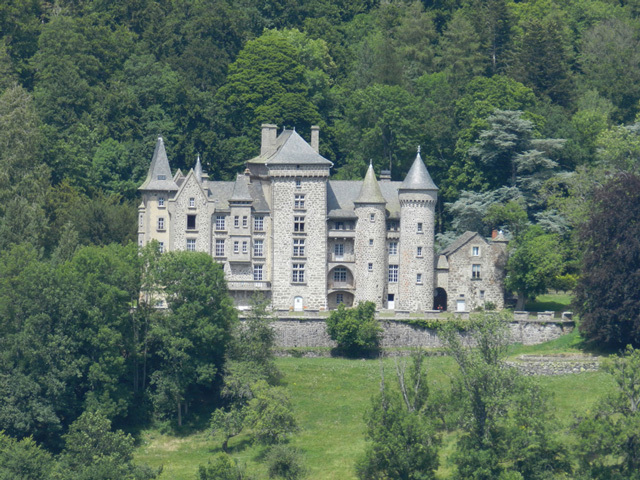 Notes: Anterroches Castle is a medieval castle located in the valley of Alagnon, in Cantal, in the municipality of Murat, though geographically and historically attached to Valagnon (town Laveissière). It is known by one of its illustrious occupants, Joseph Charles Alexander of Anterroches, famous for being the author of the quote "Englishmen! Shoot first! "At the Battle of Fontenoy and" Impossible is not French.Built in the Middle Ages, it was significantly modified in the nineteenth century in the troubadour style with battlements, turrets and mullioned windows.